While it’s yet to be seen whether New Jersey Gov. Chris Christie’s widely-covered apology on Thursday will succeed in controlling damage from the George Washington Bridge scandal, the initial verdict from Twitter is in: Criticism of the governor among users outnumbered defenders by about 3-to-1 after news broke of e-mails linking his office to closing down traffic lanes in an apparent act of political revenge. Reaction on Twitter can often be at wide variance with public opinion. A Pew Research Center analysis last March compared the results of national polls to the tone of tweets about eight major news events and found that the Twitter conversation can be more liberal than survey responses, while at other times it is more conservative. During the 2012 presidential campaign, Twitter sentiment was much more critical of Republican candidate Mitt Romney than of President Obama. A Pew Research analysis of more than a quarter million tweets found that 43% of the Twitter conversation about the potential 2016 presidential hopeful was critical of him or his administration while 14% defended Christie or criticized his opponents. The analysis covered the period between 9 a.m. Jan. 8 and 7 p.m. on Jan. 9, the day of Christie’s press conference. The analysis, using software from Crimson Hexagon, divided the Twitter reaction into two parts—the period before the Jan. 9 press conference and the hours immediately after — and found that the nationally televised event did little to shift the tone of the Twitter conversation about the governor. In the lead-up to the presser, 36% of the Twitter sentiment was critical of Christie while 11% defended him or attacked his opponents. After he spoke, assertions critical of Christie jumped to 45% of the conversation and those which, in some form, came to his defense increased to 17%. That moved the ratio of critics to defenders slightly — from a bit over 3-to-1 to a little under 3-to-1. 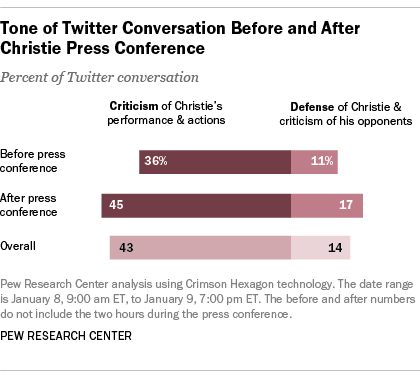 Next to criticism of Christie, the biggest element of the Twitter conversation (28%) came from social media users relaying news accounts of the rapidly unfolding drama. Another 10% of the conversation focused on how the media themselves were covering the events. And while a number of news stories speculated on the scandal’s potential impact on Christie’s political ambitions, only 5% of the early Twitter conversation focused on that aspect of the story.